"These seem to be everyone's favorite holiday candy recipe. Could be the melt in your mouth texture, or perhaps the sweet peppermint taste. 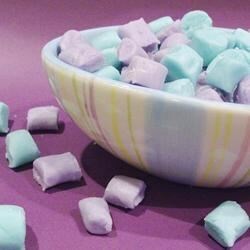 Could also be the fact that this is the easiest candy recipe around! If stored in airtight container, these can be frozen for a couple months. These can also be made into pretty shapes by rolling in granulated sugar, pressing into candy molds, and dropping them out." In a large bowl, combine cream cheese, butter, and confectioner's sugar. Mix in peppermint oil. Color as desired with food coloring paste, or leave white. Roll mixture into small balls, and place on waxed paper. Flatten with a fork dipped in confectioners' sugar. Let dry for about 2 hours on waxed paper, then freeze or refrigerate. This has always been a favorite recipe of mine. Here's a tip---use a food processor instead of mixing by hand. The mixture will roll itself into a ball and is easy to remove and refrigerate.